Where Can Bikes Fit Into the Urban Cargo Delivery Market? New York City should be an ideal place to ship cargo by bike. It’s dense, space is at a premium, traffic regularly ensnares delivery trucks, and customers demand near-instant delivery. Despite its advantages, pedal-powered freight delivery has remained a niche operation. A panel at a conference on last-mile freight delivery hosted by the University Transportation Research Center today explored why. The reasons are as simple as bollards blocking bridge entrances and as complex as New York’s regulatory black hole for electric bicycles. A panel of three cargo bike operators — Wenzday Jane of Metro Pedal Power in Boston, Franklin Jones of B-Line in Portland, Oregon, and Greg Zuman from Revolution Rickshaws in New York — spoke about their business models and the constraints they face, including one of the most formidable barriers: potential clients who remain skeptical, despite a competitive price, that bikes or trikes really can handle the freight. Zuman, from Revolution Rickshaws, echoed the sentiment after the panel. Even when delivery by cargo bike makes business sense, he said, the customers who take the leap are those who are committed to the idea, while others remain hesitant because they feel like they are working with an unproven model. “Do we really want to make this shift? Do we trust a company this small?” he asked. Here in New York, Zuman says he hasn’t received any support from the city. “There’s a lot of, I don’t want to say, hot air,” he said, “But we’re not really that tight with the city on a working level.” In fact, the city has actually worked against the cargo bike business, perhaps without even knowing it: Security bollards installed at the East River bridges create gaps that are too narrow for many cargo bikes to pass through, limiting his company’s ability to serve clients in Brooklyn. Another limitation is ensuring that cargo bikes meet food safety standards. Zuman said that refrigerated trucks dominate the perishable food delivery market because the cargo bike industry is so small that no one has developed a method to ensure high-quality refrigeration on a smaller scale. Zuman is interested in developing a “cold pod” that could fit in cargo bikes, and he’s applied for a grant from the New York State Energy Research and Development Authority, which helped organize today’s conference, to develop a prototype. Another barrier to growth for New York’s cargo bike market is the city and state’s regulations, or lack thereof, for electric bicycles. Although they are prevalent on the city’s streets, e-bikes are technically illegal in New York City and cannot be registered with the state Department of Motor Vehicles. Jones said Oregon’s e-bike laws are more liberal than other states, and using electric-assist cargo trikes allows him to serve a broader range of clients, carry more cargo, and hire riders who might not be willing to pedal up to 600 pounds of cargo on their own. “Is it absolutely crucial? Do we have to have it? Yes,” he said, adding that the biggest market for his company isn’t small businesses making artisanal foods and small goods, but mid-size regional businesses that have a need for local business-to-business deliveries. One of B-Line’s biggest customers, Jones said, is Office Depot, which uses the company to deliver goods to its Portland-area stores. However, with limitations like the inability to ensure food safety standards for perishable items and restrictions on electric-assist trikes, Zuman says his company has lost potential clients. FreshDirect approached Revolution Rickshaws about shifting some of its deliveries to cargo trike, but a year of discussions fell apart over the legal gray area for e-bikes and refrigeration concerns. Zuman says he operates electric-assist bicycles — despite their legal status “they’re everywhere,” he says of the electric food delivery bikes — but potential clients remain wary of using something that is technically illegal. Because short-distance cargo remains a limited market, some of the companies have turned to ancillary businesses to diversify their revenue stream. 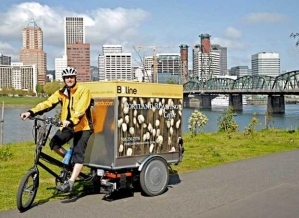 In Portland, B-Line advertises on its distinctive cargo trikes, while Zuman has lots of experience with pedicabs. Despite having a seat at the table today, cargo bikes are still far from gaining a major share of the last-mile freight market. ways, we live in the most conservative city in America. Electric tram freight could quintuple (or more) freight capacity over trucks, and be just as green as tricycles. Greener, in a sense, since it could eliminate several times as many truck trips. Chris Ward even talked about this, but our carhead governor cheerfully got rid of him for his heresies against the utopian autocentricism. This is the biggest problem with electric tram freight for a variety of reasons. Limit contract lengths, maybe to a year, and limit how many neighborhoods any one company can serve and you can keep dynamism in the last mile freight market. Might assuage your concerns somewhat? It’s not a problem at all, since doing it that way is entirely optional. Paris simply *gave* a winning trike-platform distribution company a logistics center right in the middle of the city – for free! If NYC did the same, you might see more modal shifting going on in the CBD. City support for modal optimization would be a game changer. For now, it’s status quo. The problem is that turnover times would explode, since the overwhelming majority of urban deliveries do not require a tram-load of goods. This is a problem that makes rail less competitive, even when it is fast, for many lightweight (relatively) parcel/small load cargo. Imagine you load a tram and had to stop in 50 different places to unload all the cargo. That doesn’t make any sense. The overwhelming majority probably don’t need a Prius-load of goods, for that matter. The whole point of increasing last mile freight capacity is so you can make more of those small deliveries in a single trip, without having to return to reload (or idle in traffic as much). There is a trade-off. More deliveries per trip = longer total delivery times. At one point the long span between pickup and last delivery becomes too much. Remeber: we live in a just-in-time World where stockpiles are anathema. Shifting warehouses closer to the last mile would help. Instead of large box trucks or 18 wheelers making a dozen stops, you could have a small van or car or cargo bike running the last mile from the warehouse. It doesn’t mean anything of the sort. It just means more deliveries per vehicle trip, with fewer returns to origin. That will certainly bring average delivery times down. In any case, it’s not a zero-sum game. Other modes can (and should) still be used when they are more effective. My whole point was the city just bans everything a one-size-fits-all solution, trucks, that is in many ways the worst. Staff costs will kill you. In New York, the cargo bike is competing with not only the van fleet, but the minimum-wage cart-pusher. Once you add in the 25% premium for workers’ compensation insurance on top of the salary and benefits, cycling the cargo around becomes too expensive when compared to just hiring a couple guys to push things on a cart. Fresh Direct has been doing this for years. Pardon me for not quite following you, but aren’t the two guys pushing things on a cart also “staff” with corresponding “staff costs”? How is pushing a cart substantially different from riding a cargo bike (well, it’s lower, and also allowed on the sidewalk)? Or are those guys “independent contractors”? I’m not arguing against your claims, I’m just curious. It seems, for a relatively naive and uninformed value of “seems”, that cargo bike delivery ought to work well in an urban place — more flexible than trucks, faster than carts (and at least one former NYC cargo-biking messenger, Tone, writes in a cargo-biking group). There are four reasons why it’s more expensive to hire bicycle operators than cart-pushers or van drivers. 1. “Independent contractor.” If you hire folks with their own equipment, whether vans, or carts, or delivery bikes, then you have a good argument for classing them as contractors and avoid paying workers’ comp and FICA taxes. But who is going to buy his or her own $6,000 delivery tricycle, and then look for work at close-to-minimum wage? I believe that if you have a fleet of delivery vehicles making deliveries to clients as directed by management, you need to put those vehicle operators on salary, which raises your costs. 2. Workers compensation premiums are around $25 per $100 of payroll for bicycle deliveries, and to make it more expensive, those high premiums are assessed on the salaries of everyone in the company who ever does bicycle deliveries. Whereas for most other lines of business that include deliveries, like flowers or fast food, the motor-vehicle delivery staff are included in the regular lower premiums (around $1 per $100 of payroll) paid for each employee. It appears to be another subtle form of anti-bicycle discrimination, except for the fact that the premiums are set based on claim history, not on prejudices of some state board. 3. “Envelope-pushing.” While bikes can carry up to 500-600 lbs of cargo, operating them at that limit safely and responsibly requires someone who knows what he or she is doing. It costs more to hire that kind of responsible person (and to keep them on the payroll) than it does to hire someone to push a cart around. Similarly, delivery vans are so overengineered for most cargos they carry, anyone can drive them. 1. Dudes do buy motor vans and trucks for thousands of $$$ – and pay insurance, fuel, parking, parking tix, etc. these dudes also often get paid close to min wage. Not a sound point. 2. Straw man argument. You’re targeting wrong customers if you’re trying to deliver fast food. 3. Not rocket science to ride a trike. Tougher to drive a truck! Sure, challenges exist. More to do with identifying target market, selling them on it, and delivering the goods – at a profit. That noted, workers comp ain’t doing us any favors, it’s true. Those “challenges” are challenges that every business faces! This is also nice concept to moving transportation by using bike. Who/what benefits from laws against electric cargo trikes? Is it due to safety concerns for other drivers? Insurance? I’m sorry, but as Americans we should force our lawmakers to give detailed, no nonsense explanations of why a law or ordnance exists, and if they can’t, then we should have the power to get useless laws erased. I am so tired of meaningless laws being enforced, and nothing done about them just because the police and lawmakers have bigger things to worry about. Okay, my childish rant is over. Delivery trucks are terrible for city streets, polluting the air, blocking bike lanes, endangering pedestrians and cyclists. Trucks and Cities Are Like Oil and Water. Here’s a Solution. A draft city rule would only sanction e-bikes "equipped at manufacture" with pedal-assist. Advocates say that's too narrow and would impose too high a cost on delivery workers. The city's proposed rule changes legalizing pedal-assist electric bikes on city streets won't protect delivery workers from fines and seizures.